Taekwondo is a martial art style from Korea developed there around 1950 and based on the much older Taekkyeon style, but it also added some Karate and Subak techniques. 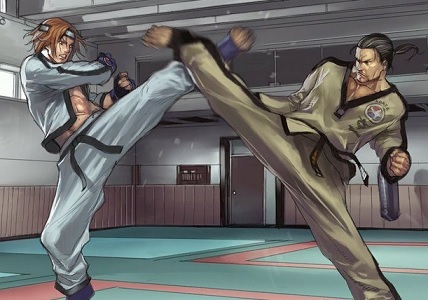 The probably most known Taekwondo using video game characters are the two you can see in the image, Hwoarang and Baek Doo San from the Tekken Games. The first Taekwondo using fighting game character is probably Kim Kapwhan from the Fatal Fury and later the King of Fighters games. A newer game character using Taekwondo is Juri Han who was introduced as a new character in Super Street Fighter IV.